Rating: "A". Near-perfect light, funny fantasy-California adventure stories. Kage Baker's first venture into book-length fantasy is out, and it's a winner. The setup: three linked novellas, opening with "The Caravan From Troon" (Asimov's, Aug 01) [note 1]. The scene: a fantasy-California (more or less). The star: "Smith", an assassin who's trying to change careers. The supporting cast: Lord Emenwyr, a sickly demigod, half- (or is it a quarter?) demon. Nurse Balnshik, Emenwyr's minder, 100% demon, but glamorous: "Do you know any other midwife who can also tear apart armored warriors with her bare, er, hands? Lovely and versatile." Mrs. Smith (no relation, note 2), two-time winner of the Troon Municipal Bakeoff, caravan cook and, later, co-owner of the Hotel Grandview, Salesh-by-the-Sea. -- and a host of Keymen, Runners, more Smiths, Yendri, bandits, barmen, demons, gods, parents, siblings.... Plus one yellow journalist, recently deceased. And a really, really dumb real-estate developer. On the fifth day, they ran aground. Smith had relinquished the helm to Cutt while he downed a stealthy post-breakfast filler of pickled eel. He swore through a full mouth as he felt the first grind under the keel, and then the full-on shuddering slam that meant they were stuck. He scrambled to his feet and ran forward. "The boat has stopped, Child of the Sun," said Cutt. "That's because you ran it onto a sandbank!" Smith told him, fuming. "Didn't you see the damned thing?" "No, Child of the Sun." "What's this?" Lord Ermenwyr ran up on deck, dabbing at his lips with a napkin. "We're slightly tilty, aren't we? And why aren't we moving?" "You have hyacinth jam in your beard, my lord," Willowspear informed Lord Ermenwyr. "Do I?" The lordling flicked it away hastily. "Imagine that. Are we in trouble, Smith?" "Could be worse," Smith admitted grumpily. He looked across at the opposite bank. "We can throw a cable around that tree trunk and warp ourselves off. She's got a shallow draft." "Capital." Lord Ermenwyr clapped once, authoritatively. "Boys! Hop to it and warp yourselves." The inspiration: "The author would be remiss in not thanking the shades of Thorne Smith, Fritz Leiber, L. Sprague De Camp and Noel Coward for their inspiration; but primarily this world owes its existence to stories made up in preliterate childhood, when the author peered at Maxfield Parrish's fantasy illustrations and tried to imagine what they represented..."
Do give the book a chance to get moving, as the introduction is largely scene-setting, and it's a bit slow-moving. And the episodic, "fix-up" structure has annoyed some readers (not me). Otherwise, it's a near-perfect light fantasy: cinematic, witty, funny, amiable, rambling, baroque, romantic, and fun. If you've liked earlier Kage Baker books, what are you waiting for? 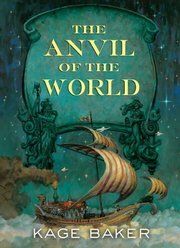 And if you haven't tried her yet, Anvil would be a fine place to start -- especially if you prefer fantasy to SF. "Lord Ermenwyr may be Ms. Baker's most inspired creation. He is a walking contradiction -- at the same time that he is a cowardly, decadent, foppish, hedonistic, malingering, neurasthenic, selfish, polymorphously perverse substance abuser, he can show honest loyalty, friendship and gratitude, and when he turns sentimental he manages to become, against all odds, weirdly lovable." -- Gabe Mesa, the best review I saw online. "...this is quite an enjoyable novel. It is fairly witty throughout, and cleverly imagined... The moral is humanistic and affecting... It's an entertainment, with just a hint of a serious core to it. Amiable, a bit rambling, not a major work but good fun." -- Rich Horton, who liked the book rather less. fiction - The Dust Enclosed Here by Kage Baker.